On any other day, this would be a fashion crime. Skies are grey in Sydney and play is delayed on day three of the third Test between Australia and Pakistan in Sydney. Wait a sec, did we just say DAY THREE OF THE SYDNEY TEST? We know we did because we just typed it. 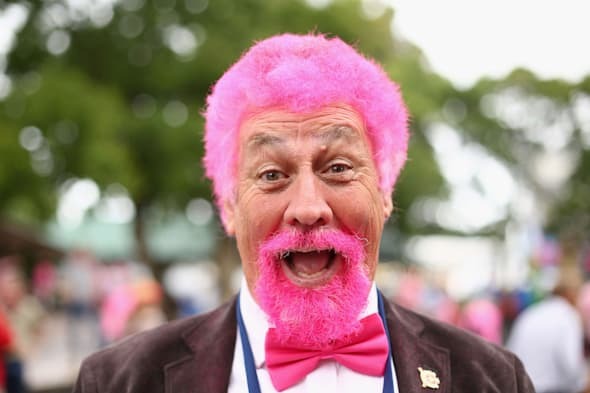 And what day three of the Sydney Test means is PINK DAY!!! Why not the eyebrows, mate? Yes, this is Jane McGrath Day, the day when the McGrath Foundation has its big fundraiser. And everyone wears pink. Or magenta. Or cerise. Or puce. Or whatever shade they can get their hands on. It's great to see. 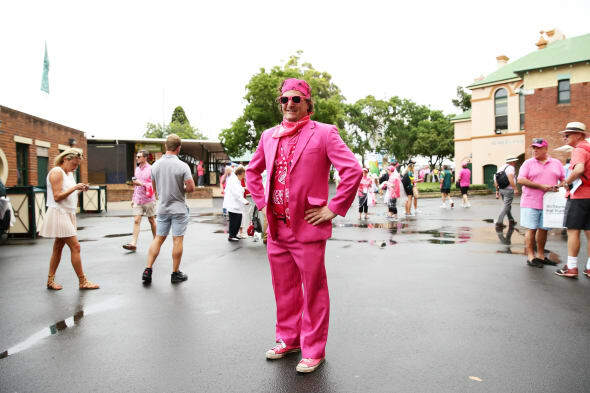 Skies are leaden but in the stands at the SCG, and in the beer queues, and everywhere, it's all pink. As we told you last year at The Huffington Post Australia when we spoke to McGrath Foundation CEO Petra Buchanan, the foundation does NOT exist to fund breast cancer research. It's all about raising money for nurses to care for patients with breast cancer. 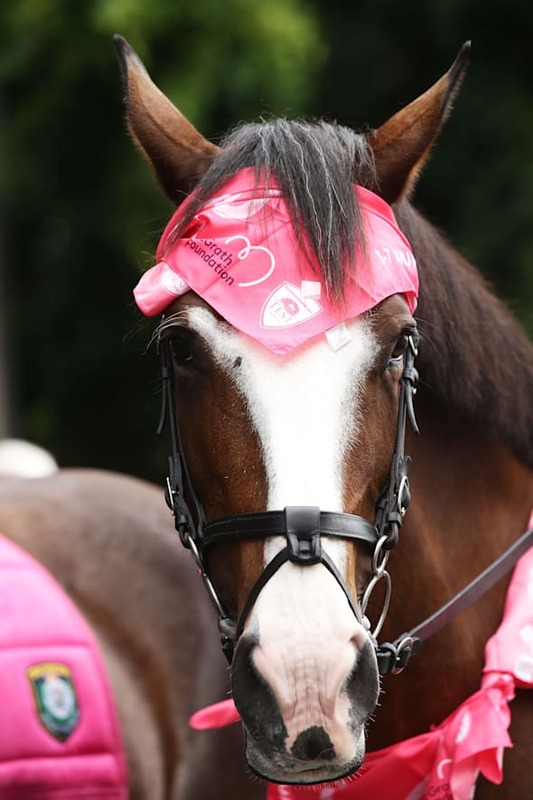 This year, the foundation aims to raise $390,000 to fund one McGrath breast care nurse. As we all know, the foundation started after champion Australian fast bowler Glenn McGrath lost his wife Jane to breast cancer. 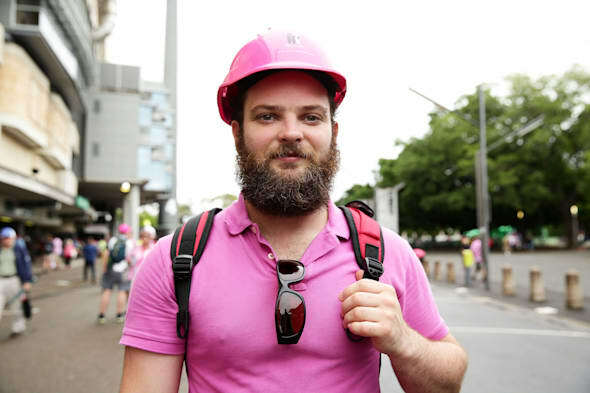 Glenn was on hand at the SCG, as he always is on this day, to do his bit. Onya, Pidge. Brett Lee looked dashing in what we'd call a cinnamon pink blazer. Is that even a colour? Where's the lifestyle editor when you need her? Most people in the media box have dressed up for the day too. Provisional winner of the pinkest person goes to Neroli Meadows of Fox Sports and Triple M. But the day is young. The meadows are blooming pink. But Jane McGrath day is really all about the fans. Average people like this guy. Now that's what we call a hard hat. Note the pink menus in the background. Nice. Your intrepid correspondent has passed the time staying awake with a (eek!) pink coffee. Which a sneaky barista made by doing this. Anyway, think pink everybody. And maybe think blue too, because the grey skies are still preventing play here at the SCG. How come nobody bought us a pink sombrero for Christmas?